Apache Ignite was always appreciated by its users for two primary things it delivers - scalability and performance. And now it grew to the point when the community decided to revisit its discovery subsystem that influences how well and far the database scales out. The goal was pretty clear - Ignite has to scale to 1000s of nodes as good as it scales to 100s now. Check what we did to solve the challenge. Putting aside the regular bug fixes and performance optimizations, the Apache Ignite 2.3 release brings new SQL capabilities and Ignite persistence improvements that are worth mentioning. Let's start with SQL first. Apache Ignite users have consistently told us that despite all of Ignite’s SQL capabilities, it’s been at times challenging trying to figure out how to start using Ignite as an SQL database. This was mostly caused by scattered documentation pages, lack of “getting started” guides and tutorials. We’ve remedied this oversight! All related SQL knowledge has been curated in a single documentation domain. Are you curious about the SQL scope? Go to the new SQL Reference Overview section! Cannot wait to learn how the Ignite SQL engine runs internally? We’ve prepared an Architectural Overview section for you. Simply need to know how to connect to an Ignite cluster from an SQL tool? Here is a tooling section for you. Let’s take a look at some specific SQL features released in Ignite 2.3. First, we’re proud to deliver support of ALTER TABLE command. Presently, the command allows adding new columns to an SQL schema in runtime -- avoiding any cluster restarts. Once a new column is added, it can be turned into an index. Again, in runtime. No restarts! Another significant addition seen in Ignite 2.3 is the integration with SQLLine tool that is bundled with every Apache Ignite release and can be used as a default command line tool for SQL based interactions. Ignite native persistence keeps getting more attention and installs -- which is why the community released a feature requested by at least a dozen users. The feature allows enabling the persistence for specific data sets. Before Ignite version 2.3, the persistence could be enabled globally only. This data region will consume up to 500 MB of RAM and will store a superset of data on disk ensuring that no data loss happens in case of a crash or even if there is no more space left in RAM. Flip through our release notes to see all the changes and improvements available in Apache Ignite 2.3 -- and, for sure, download and use this version in production. This is our third community update – there’s a lot going on, so let's get started. Apache Ignite experts have already spoken at two meetups this month, both in Silicon Valley, but there are several more scheduled this month around the world. On Sept. 9 Apache Ignite PMC chair Denis Magda was the featured presenter at the Big Data and Cloud Meetup in Santa Clara, Calif. His talk, titled "Apache Spark and Apache Ignite: Where Fast Data Meets the IoT," was highly rated and we’re planning a hands-on workshop with meetup organizers for November. On Sept. 13 Denis also spoke at the SF Big Analytics Meetup in Mountain View, Calif. Again, to a packed room. The topic of his talk was "Better Machine Learning with Apache Ignite." But Denis isn’t having all the fun – next Monday (Sept. 18), technology evangelist Akmal Chaudhri will speak at the Cambridge .NET User Group. The title of his talk: "Scale Out and Conquer: Apache Ignite for .NET Users." Bay Area In-Memory Computing Meetup, Wednesday, Sept. 20 – Denis will present, "Apache Spark, Ignite and Flink: Where Fast Data Meets the IoT." Internet of Things (IoT) New York Meetup, Monday, Sept. 25 – Akmal will present, "Apache Spark and Apache Ignite: Where Fast Data Meets the IoT." NYC In-Memory Computing Meetup, Tuesday, Sept. 26 – Akmal will present, "Powering Up Banks and Financial Institutions with Distributed Systems." New York Kubernetes Meetup, Wednesday, Sept. 27 – Akmal will provide a DevOps perspective on the orchestration of distributed databases and Apache Ignite. On Sept. 5, Akmal published “Using Java and .NET apps to connect to an Apache Ignite cluster, that details how to create an Apache Ignite cluster that can support the reading and writing of user-defined objects in a common storage format. This is particularly useful in situations where applications need to work with objects but these objects will be accessed by different programming languages and frameworks. Next up, on Sept. 12, was Akmal, who published “Kubernetes and Apache® Ignite™ Deployment on AWS.” That post walked through the steps required to get Kubernetes and Apache Ignite deployed on Amazon Web Services (AWS). Stack Overflow. Stack Overflow is a question and answer site for professional and enthusiast programmers. Habrahabr. Habrahabr (also "Habr") (Russian: Хабрахабр, Хабр) is a Russian collaborative blog with elements of social network about IT, Computer science and anything related to the Internet, owned by Thematic Media. In-Memory Computing Planet (blogs and events) Add you blog feed! “Meetup in a Box.” If you would like to speak at a meetup, start or support a meetup, or have questions about meetups in general – let me know! I can help get you up and running with everything you’ll need. Please share any resources I've excluded in the comments section and I'll include them in the next edition. The power and beauty of in-memory computing projects are that they truly do what they state -- deliver outstanding performance improvements by moving data closer to the CPU, using RAM as a storage and spreading the data sets out across a cluster of machines relying on horizontal scalability. However, there is an unspoken side of the story. No matter how fast a platform is, we do not want to lose the data and encounter cluster restarts or other outages. To guarantee this we need to somehow make data persistent on the disk. RDBMS is a bottleneck. No matter how fast your in-memory technology project, you can accelerate read operations only because every write has to be persisted to the disk -- which is usually a single machine running an RDBMS instance. RDBMS is a single point of failure. Your distributed in-memory cluster usually consists of dozens and even hundreds of nodes which means you can safely lose this node here or drop that node there without worrying about data consistency and availability. However, if the RDBMS used by the cluster fails, then what? The answer is obvious -- the cluster can no longer be utilized because the RAM and disk parts go out of sync. SQL over RAM only. Apache® Ignite™ provides SQL database capabilities, however, you can only leverage them if all of the data and indexes are located in RAM. If a single piece of data, represented by a disk copy located in the RDBMS, then an Ignite-only SQL query will return an incomplete result set. Requried RAM warmup. When your cluster goes down, you have to restart it and preload all of the data from the RDBMS to RAM. That’s essential if you use SQL or similar advanced querying languages. This dramatically increases the overall time of the downtime and can cost a lot of money. If you use either Apache Ignite 1.x or 2.0 along with the RDBMS for disk storage, then you will hit these limitations. It’s just the way in-memory architectures are integrated with the disk. Keeps using RAM as a first memory tier for data and indexes -- giving all of the benefits you had before. Supports durability criteria by treating disk as a secondary and larger tier that works in a distributed fashion and seamlessly integrates with the whole memory architecture. Supports the instantaneous cluster restarts -- once your cluster is up and running there is no reason to wait for RAM's warmup, go ahead and turn on back your applications that can safely execute all operations including SQL. The data and indexes will be taken from disk. Curious about how Ignite achieved these huge advantages? Lifting the curtain…. The Apache Ignite memory-centric platform is based on the durable memory architecture that allows storing and processing data and indexes both in-memory and on disk when the Ignite Persistent Store is enabled. 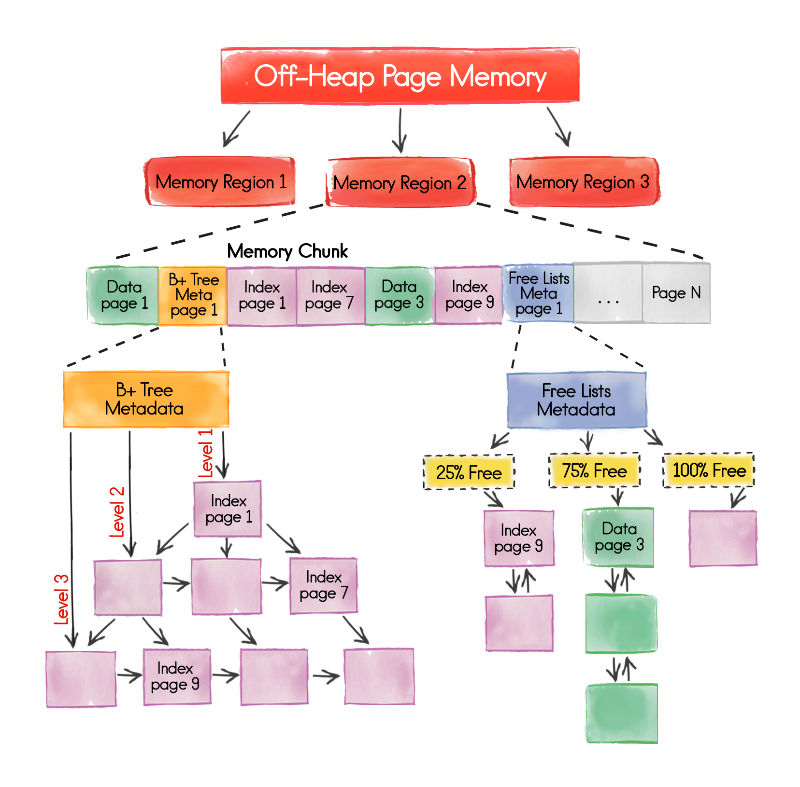 The memory architecture helps to achieve in-memory performance with the durability of the disk using all of the resources available in the cluster. The durable memory is built and operates in a way similar to the virtual memory of operating systems such as Linux. However, the one significant difference between these two types of architectures is that the durable memory one always keeps the whole data set and indexes on the disk -- if the Ignite Persistent Store is enabled -- while the virtual memory uses the disk for swapping purposes only. Persistent Store is a distributed ACID and SQL-compliant disk store that transparently integrates with the durable memory as an optional disk layer (SSD, Flash, 3D XPoint). Having the store enabled, you no longer need to keep all of the data in memory or warm-up the RAM after a whole cluster restart. The persistent store will keep the superset of data and all the SQL indexes on the disk making Ignite fully operational from the disk. Tired of hooking up Ignite with an RDBMS? Go ahead and download Apache Ignite 2.1, enable Ignite Persistent Store, and launch your first durable Ignite cluster that distributes data sets and workloads relying on the performance of RAM and durability of the disk! Finally, Apache Ignite 2.1 can boast about another achievements in .NET, C++, SQL and Machine Learning. Go ahead and discover them! Apache Ignite community welcomes you to attend Big Data Bootcamp on March 27th, 28th and 29th 2017 in Santa Clara, USA. The conference gathers experts and vendors from Big Data realm in sunny California who will be covering a variety of Big Data products and technologies, including, but not limited to, Hadoop, Spark, NoSQL, Data Science, Machine Learning, Artificial Intelligence & Deep Learning. Apache Ignite will be introduced at the conference by its PMC chair and committer - Denis Magda. As all we know, in-memory data grids bring exceptional performance and scalability gains to applications built on top of them. The applications truly achieve 10x more performance improvement and become easily scalable and fault-tolerant thanks to the unique data grids architecture. However, because of this particular architecture, a majority of data grids have to sacrifice traditional SQL support requiring application developers to completely rewrite their SQL-based code to support data grid specific APIs. This, however, is not true for Apache Ignite. In this presentation, Denis will introduce Apache Ignite SQL Grid component that combines the best of two worlds - performance and scalability of data grids and traditional ANSI-99 SQL support of relational databases. Moreover, Denis will take an existing application that works with a relational database and will show how to run it on top of Apache Ignite with minimum efforts. The talk is called "Apache Ignite SQL Grid: Hot Blend of Traditional SQL and Swift Data Grid" and takes place at 1:00 PM - 1:40PM on March 28. Refer to Big Data Bootcamp's agenda for more details. Finally, use promotional code SPEAKER to receive $200 discount on or before March 15th by registering at the conference site. Apache Ignite community is pleased to announce Apache Ignite 1.9 - the next minor release of a well-known in-memory data fabric. The release, as usual, encompasses many bug fixes, performance improvements and fresh features. Below you can see a description of the most significant updates. Apache Ignite was integrated with Kubernetes which is a modern open source container cluster manager. The integration helps to simplify a deployment of an Apache Ignite cluster in environments managed by Kubernetes and let the latter care of resources management, cluster's scalability and lifecycle. For instance, you're no longer need to monitor a cluster state constantly to be sure that the number of cluster nodes doesn't go, let's say, below 4. If Kubernetes sees that one cluster node is disconnected and only 3 are left then it will start one more automatically to meet the deployment requirements. Refer to Kubernetes Deployment Getting Started if this is the feature of interest for you. Apache Ignite 1.9 can boast of much better performance for core cache operations and SQL queries in compare to the previous Apache Ignite 1.8 release. In general, we observe up to 40% performance increase for particular operations. It's no longer a challenge to reproduce the performance numbers. Starting with Apache Ignite 1.9 release all the benchmarks are delivered in every Apache Ignite distribution and can be easily executed in your own environment. The community keeps spending significant time improving SQL Grid component that empowers Apache Ignite users with in-memory database capabilities. In this release, DML (Data Modification Language) support was expanded to the level of Ignite.NET and Ignite.C++ APIs. Plus, a streaming mode was introduced for DML allowing to execute DML operations even faster for specific scenarios like initial data preloading. One more SQL Grid related optimization makes it possible to parallelize a query execution on every Ignite node where the query has been mapped. By default, a query is executed in a single thread on every participating node. However, for a variety of OLAP use cases it might be a bottleneck and this is where the query parallelism can help out. Apache Ignite implemented .NET TransactionScope API allowing to work with distributed Apache Ignite transactions fully relaying on standard interfaces available in .NET Framework. Refer to this documentation page for more information. Ignite.C++ introduced support for well-known continuous queries API. Now, you can listen to data modifications happened on Apache Ignite's distributed caches side from your C++ applications. Ignite’s spark integration was upgraded to the latest Spark version. Presently, you can leverage from Ignite Shared RDDs in applications using latest Spark version. Go and grab the latest 1.9 release from our main site. Looking forward to your feedback!